Good for you! That's great Annie! i honestly reckon at least half of them views are from me, i like literally every hour our so check your blog for a new post. im so glad you post regulary now, and that you can film. ive missed you loads :D your so inspirational, beautiful, classy, and down to earth. youve taught me alot about everything. i really hope you reply! Congratulations !!! I enjoy reading all your blog posts, thats great. 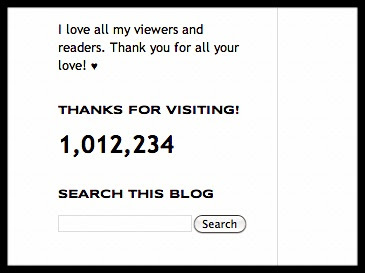 I WISH I COULD REACH 1 MILLION VIEWS ON MY FASHION BLOG! I POST VERY FREQUENTLY! http://www.SydneyFactorFashion.blogspot.ca I love your blog Annie!! :) I am going to follow some of the other ppl on here who left their blog link! Hi Annie! how do you feel about fiber pills? or fiber lax pills if your fiber intake is minimal due to living situations/ health reasons?